Norden Crafts: Lizzie*Kate News, Homespun Elegance Freebie, and a pic of my baby girl! I have to apologize for omitting this from the Homespun Elegance Feature on August 8th! 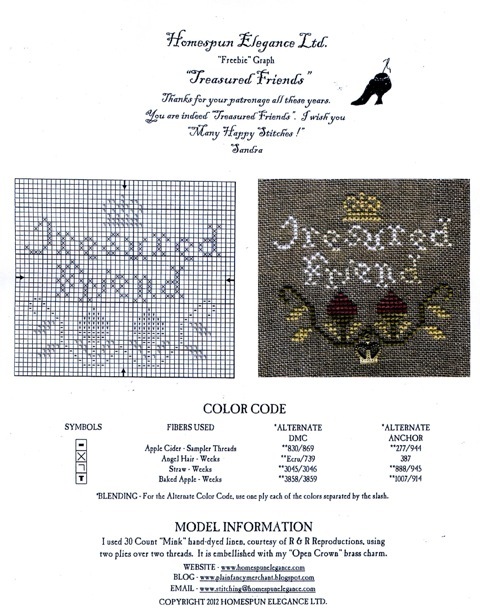 Sandra from Homespun Elegance has designed this adorable FREEBIE as a thank you to all of her fans. What a cute idea for an ornament, or pinkeep, or bookmark, or tiny framed piece. Enjoy! THEY ARE COMING!!! Part 3 of Lizzie*Kate's Mystery Sampler is ready to ship! Thank you to all 3,500 of you that supported this incredible design! It has sparked excitement for the industry in a way that we are all so incredibly proud of and thankful for. Linda, you have been absolutely amazing to work with, and I hope we can do this again someday! This has been an incredible ride, and I am sad to see it almost over. A well placed Post-It Note hides Part 3 of the sampler..... for now! IMPORTANT NEWS - We are awaiting the 30ct Guacamole for the bonus pattern from Weeks Dye Works. Due to an unforseen production error, it has set back the delivery of this fabric by approximately a week. We don't want to delay the shipment of the patterns, because we know that all of you stitchers are so excited to see the remainder of the main piece! While you are all waiting for the bonus fabric, you can start stitching the 3rd installment of the main piece. When the linen arrives here at Norden, we will ship it out to our shops right away along with the bonus threads. We sincerely apologize for the inconvenience this causes. Hannah's 1st Day of 4th Grade - Where has the time gone? I can't believe she is 9 already, and looking like she's 13. Some of you probably remember meeting her at shows when she was just a baby, well here she is now! aww hannah is so cute..